Ben Blair originally wrote this post for the Jan 15, 2011 edition of the Showfax column Actor’s POV. He then re-posted it on the blog on his website. If you go to the original post there is some great commentary by Bonnie Gillespie which I have removed here and replaced with my own thoughts on the article. After you read Ben’s post you might think that he just got really lucky, and it was totally random and it could happen to anyone. While that’s partly true, I want you to pay attention the research Ben did, how specific he was about what he wanted, and how he approached people and the situation. You’ll note Ben didn’t stalk some producer to a Ralph’s and shove his headshot at her in the middle of the canned food aisle. Also pay attention to how Ben reacts when he doesn’t book the commercial. Most of us might have just gone home and sulked, but Ben didn’t. Hopefully you’ll also notice the long-term mindset Ben came from, as well as his immense gratitude. You’re a wise man, Ben Blair. A wise man indeed. Without further ado, Ben’s story. Enjoy. This is not an article about how to get a job. I’m not going to be offering you the “secret to success” or my “one proven technique” to a fruitful career in television. I have no clue what that would be and even if I did, I find that a sort of marketing a turnoff. I am in no way, shape, or form an expert in anything, much less the topic of this article. In fact, the events that led to this story continue to baffle me, and I’m not sure I could repeat them if I tried.So what IS this article about? Well, it could be about a couple things. At first it’s going to seem like an article about using Twitter to get meetings. And that is a HUGE part of why this happened. And quite honestly, it could simply be about advantages to owning a smart phone with a data plan. However, while Twitter and having a smart phone were certainly major catalytic components to this story, they are not the focus. What this article IS about is simply my perspective on what it means to BEGIN building a relationship with a person (or people) whose work you respect and admire. In December, I had the fortunate opportunity to spend a day shadowing Joe Russo, director and executive producer of NBC’s Community. [Photo.] And I got this opportunity because I tweeted that I wanted to meet him. WHAT? Yes, you read that right. While I’m trying to dip my toes in the directing and writing disciplines, I’m primarily an actor. In November, I went on a commercial audition for a Taco Bell commercial with Mel and Liz Casting. After I signed in, Kim, the session runner, explained the spot and went on to say how funny she expected it to be and that it should be a fun shoot because the Russo brothers were directing. At that moment, I really wasn’t familiar with the Russo brothers, and telling this story is somewhat embarrassing because had I been doing my homework correctly, I would’ve been. Kim followed up her mention of the Russo brothers with: “They directed the pilot of Arrested Development.” Sweet, right?Arrested Development was one of my favorite shows, so I thought it was sweet. As I waited for my turn to audition, I read over the sides a few times (the commercial was indeed pretty funny), and then proceeded to pull out my iPhone and look up the Russo brothers. A quick peek at a Wikipedia article and my eyes were opened. Not only had they directedArrested Development, but the story of their careers was nothing short of inspiring. Read the first two paragraphs of the Wiki story; trust me. Credits on Lucky, LAX, What About Brian, Carpoolers, Running Wilde, and Community. They’re also executive producing and directing the pilot of the upcoming ABC show Happy Endings. In my opinion, they’ve basically become the go-to guys for directing comedic pilots in this town–particularly in the single-camera domain. As I pored through these credits, I began to get very excited. The reason this was so exciting was because for more than a year I’ve been developing a TV pilot of my own with many similarities to the shows on which they’ve directed-written-produced. All of a sudden it hit me; these are the guys I need to meet. Who knows what will happen, but if I could meet anyone that might be helpful, these would be the guys. It was my turn to audition, so put away the phone, went in the room, and had a blast. Sadly, I did not book the commercial. As I got home, still on a high from this new information, I wondered what to do. My friend Stacey Shevlin encouraged me to “put it out in the universe.” So I did. I went to Twitter and typed the following: “If I could meet any director/writer in Hollywood right now, it would be the Russo brothers; they’ve got the goods.” No “@” symbols, no hashtags (#), nothing. Just a plain old sentence. I responded. “Is this real? Holy cow, that’s amazing.” And just a few moments later I had another response. “Yes, message me your email and I’ll get you our number.” So, I just put my email out there for the whole world, I mean, what was I going to do at this point, NOT send my email? And again a few minutes later, I had an email from Joe with the number to their office, his assistant’s name, and instructions for scheduling the visit. That Monday, I contacted the office. I called and the man on the other end said, “Russo brothers.” My first thought was, “I guess it was real after all.” I gave my name and said, “I THINK I talked to Joe on Twitter and he said to call and schedule a set visit.” Ari, Joe’s assistant, took everything from there. He told me to send an email, pick a couple days during the next stretch that Joe was directing, and he would follow up with me closer to the shoot week. Wow. I really am going to set to hang out on the set of a major network television show and follow around the executive producer. It was a completely euphoric feeling. However, careful not to jinx anything, I told almost no one of the news. Sure enough, about a week later, Ari emailed me, arranged the details, and scheduled me to come visit set. The day I would be visiting was December 16th, the last day before the winter hiatus. From there, Ari took me over to another part of the set where a few other guys were hanging around. It turned out to be other directors also shadowing Joe that week. After exchanging names, they all recounted their backgrounds and stories of why they were shadowing. One was a graduate student at UCLA who’d met Joe at a UCLA alumni networking event and was invited to visit. Another was a talented commercial director named Tim Kendall, who’d done several national commercials and was looking to break into TV and happens to be neighbors with Danny Pudi. The last was Erik White, who recently directed the feature film Lottery Ticket. I have to admit, I felt a little sheepish being there with these guys who’ve been establishing themselves as working directors. Especially when I introduced myself as Ben, an actor who’s here through Twitter. I definitely got a couple of odd looks until I shared the story with them as well. The day started a little slow. Joe had to shoot a quick scene with minimal crew because of the confined space they were using (Dr. Phil’s bathroom), so I hung out with the other shadowing directors. That quick scene ended up taking awhile and then the set broke for lunch, so for the first couple of hours, I didn’t see Joe at all. I could’ve been bummed–wondering when I was going to see him–but I decided this would be a great time to learn from these other directors. They all had something to contribute and were at different points in their careers. It was fascinating to hear them talk about camera equipment, working with actors, setting up shots, working on their own projects, and their hopes and dreams with each other. You could see them learning from each other and I soaked that stuff up like a Brawny towel after a Kool-aid spill. I figured, “Hey, why only try to develop a relationship with one director when I can develop a relationship with four? Don’t you think it might be nice to see Tim in a callback on a commercial down the road, or walk into a room and audition for Erik’s next big movie?” Heck yeah it would. After lunch, things definitely picked up. The full crew was back, along with the cast called that day. Spirits were high as this was the day everyone was giving their holiday gifts. Joel McHale stopped by with sweatshirts that read “Glendale Community College.” Show creator Dan Harmon had given everyone letter jackets with their names on them. Needless to say, everyone was in a good mood. I have a feeling though that it wasn’t just the holidays that had people in a good mood. I could tell that this was a wonderful set. The respect and courtesy the cast and crew showed each other was inspiring. [Photo.] This was by far the friendliest and most sincere set on which I’ve ever been. I could tell that people respected Joe. He never once raised his voice throughout the day. When he said they were ready to shoot, everyone focused and got the job done. It was if each member of the cast and crew took it as their personal responsibility to make sure that the show was its absolute best and that any visitor on the set that day felt welcomed and comfortable. Actors Yvette Nicole Brown, Danny Pudi [photo], and Donald Glover all made a point to come over and specifically say hello. The ADs, the grips, the makeup artists, and the stylists all were kind and gracious as well. It was clear that my instincts about wanting to work with Joe were in the right place. It wasn’t “all work and no play” either. Jokes were flying around, the set was jovial, and I could see people cared for one another. Can you really ask for anything more from a job? Don’t you think going to work every day in a place like that would be enjoyable? Want an example of when you know you have a good set? How about when the actor who plays the principal on Glee, Iqbal Theba, makes a special trip to the set just to say, “Hi and happy holidays.” Oh, by the way, he also plays Abed’s dad. Yeah, They’ve got something good over there atCommunity. The rest of the day, I just watched and observed. When Joe was busy directing, I would take a moment to pick the brain of writer Megan Ganz. I asked her about the writers’ room, working with Joe, her background, and how she got the job. As I spoke to various people, I started to see a pattern. The point of all of this is that the individuals who make this show care about their relationships. As the day continued and the crew moved inside for the last couple shots, there was some downtime. Joe asked me to walk with him as we moved to the next setup. He talked about how he and his brother got their start, directing the show, working with the other executive producers, and balancing family life. I got to ask him questions about working with actors and the crew and what differences he saw in directing TV versus movies. I liked how he equated being a TV director to a “thief in the night,” as he put it. “In television, you’re not there every day like the cast and crew. They become comfortable with their routines and ways of doing things. You have to be able to come in, keep people happy, and still get what you need to get the job done.” Joe was naturally good at that. I could see him handle a myriad of issues, often overlapping each other, but never once look like he was under any stress or pressure. He never raised his voice, never yelled, never demanded. A complete class act. And his cast and crew returned the courtesy. I got so much out of the day and I didn’t ask for anything. I never once asked him to look at my work, read my script, take a meeting. I just wanted to learn. I think that’s an important step in developing a relationship with someone. You show them that you respect their time and the work they are trying to do. Even if I never get a chance to visit again, I know that I put a good foot forward in that regard. Of course, I hope that isn’t the last interaction I have and I do hope to visit set again soon. After I recounted this story to Bonnie Gillespie–resulting in me writing this story–she asked, “Did you ask him what it was that made him write you back?” Idiotically, I didn’t, but I did email him a few days after Christmas and ask. Again, within minutes, I had a response. He said he saw on my Twitter account that I was “an actor, a fan of comedy, in the same part of town, and that my tweets were intelligent.” It’s amazing to me that something that small could cause him to make a gesture to me that meant so much. Oh, as I was walking out the door that day on set, Joe said, “You have a reel, right?” I told him I did. And he said, “Make sure you send the link. We’ll get it over to casting.” Wow. You’d better believe I raced off the Paramount lot straight to Target to get thank you cards for both him and his assistant, which I then wrote and mailed that night. Thinking about this experience has reaffirmed a couple of ideas for me. First, when you are specific about what you want, the universe will help you out. But you need to be specific. Very specific. Had I written, “I would really like to meet a comedy director,” nothing would’ve happened. I found the two guys who I felt were the most appropriate people for me to have on my radar based on my current and future projects and acted on it. Whether you put your goals on Facebook or Twitter or talk about them at networking events or in class, be specific. Second, when you are at the genesis of a relationship you want to have, please put the focus on learning and not promoting. Not only does it reflect better on you, it gives you the opportunity to be informed and surprised by new information you may not have had previously. Note: Update on a RETURN to Community! 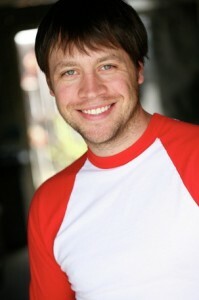 Ben Blair is a Los Angeles-based actor-writer-director from Fort Pierre, South Dakota. Ben cut his professional performing teeth at the Minneapolis Children’s Theatre and in the vibrant Twin Cities theatre community. Ben has done a number of national commercials and can currently be seen in Keystone Light “Keith Stone” commercials as well as in the webseries The Temp Life. When not acting, Ben is busy developing content for his production company, Golden Rodent Productions. Ben is represented by Robyn Bluestone Management and Commercials Unlimited. For more about Ben, visit BenBlairDoneThat.com.